The biggest threat to our future health is our poor nutrition. Despite living longer, we are sicker. Rates of obesity, diabetes and food allergy have nearly tripled in 30 years. Although more of us are eating enough food for energy, we increasingly lack quality of nutrition. As well as mis-information from food companies and government subsidies for processed food, our big problem is ignorance. This is sadly true of health professionals – even doctors have only a paltry few hours of training on nutrition. We have lost our connection with real food and the ability to cook, with disastrous consequences. Most of our calories now come from processed foods, packed with chemicals and additives and lacking nutrients. Even our vegetables are grown intensively for supermarkets so they lack essential nutrients. We can reverse this disaster by properly educating our children. Just as we learn to read and write, let’s make food a compulsory core subject and a continuous part of education, from kindergarten to university. This would include all aspects of food – where it comes from, how to sustain it, what it’s made of, how to cook it, and finally, what effect it has on our bodies, our environment and our gut microbes. Our legacy will be to ensure the next generation are properly educated to make the right healthy food choices for themselves and the planet and reverse our disastrous epidemics of food-related illness. We are what we eat – so let’s make ourselves better. Tim Spector is a Professor of Genetic Epidemiology and Director of the TwinsUK Registry at Kings College, London. 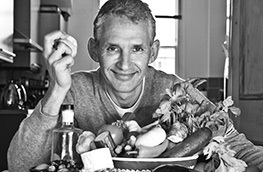 He is a prolific writer with several popular science books and a regular blog, focusing on genetics, epigenetics and most recently microbiome and diet (The Diet Myth).